Moving house? New home not ready yet? Renovating, redecorating or decluttering your home? Relocating abroad? Can’t get your car in the garage for hobby or sports equipment? Or having a big clear out? SECURITY - 24 HR SECURITY ON SITE BY KNIGHT SECURITY SOLUTIONS. PRO-RATA PAYMENT DUE ON RECIPT OF INVOICE. Insurance Cover: Your goods must be insured to their full replacement value for the complete duration of your storage period. 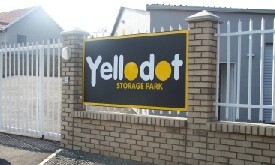 Identification: When you move goods in or out of Yellodot premises you’ll need to bring your access card for the security to check. An Emergency Contact Number: We will need an alternative contact name and number, in case of emergency. Please contact our offices for the latest vacancy schedule and tenant application forms.